me again...I'm away from home for a few days but I wanted to check in and share some amazing projects I've seen this week. I am always amazed by the ideas that come to peoples mind. Stuff I would never think of. Hope you are inspired too! 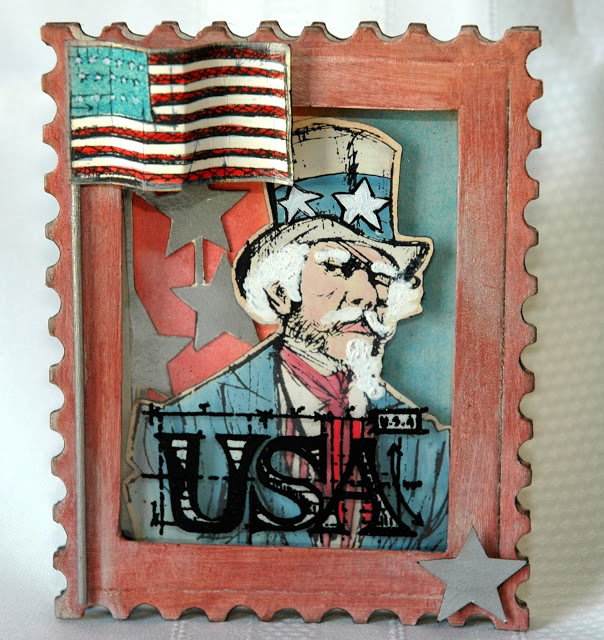 Starting with this card by Candy Colwell. Seriously, who would think to add white hair to the Time traveler guy to make Uncle Sam? And that USA stamp...never seen it used better. Bravo Candy! You can go to the Ranger blog to see how Candy did it. She makes it look so very easy. 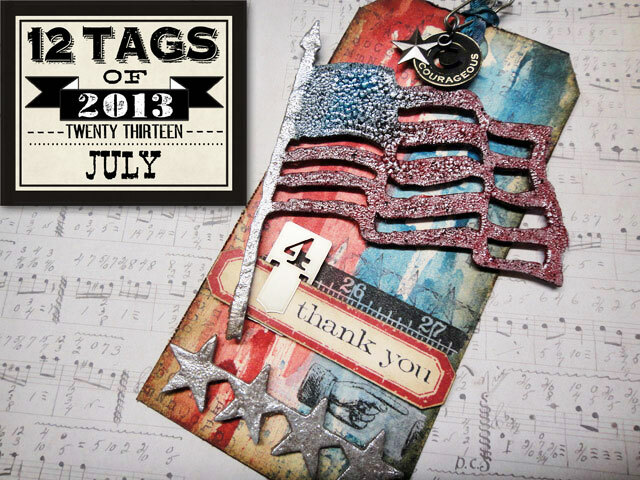 Then there was this tag by Karen Knight, honoring the fallen Arizona fighters with a red, white and blue theme. Love how she used all the Chit Chat words running down the tag. I have never included that many words on one project but Karen's tag has inspired me to rethink that! My friend Richele made this great card using the same Flag stamp as Candy, Richele also used the rest of the stamps that come in the set in the background. What a great technique, to fill in what otherwise could have been blank white space with light grey images behind the flag. The red and white paper string really ties it all together (no pun intended). Then there is Barbarayaya...always exciting to see what she is up to. Take this darling little suitcase. 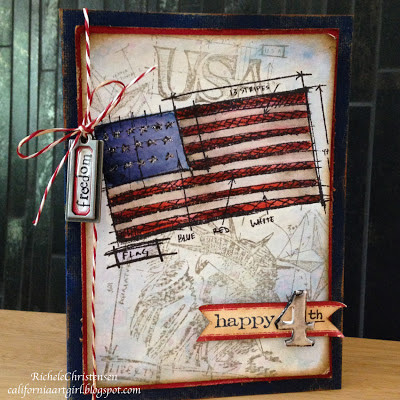 Love the blue fabric under the USA and the use of a texture fade to make the red stripes. Clever girl. The back is a good as the front, but you will have to pop over to her blog to see it! And when you are there take a gander at her "12 tags" entry for June. 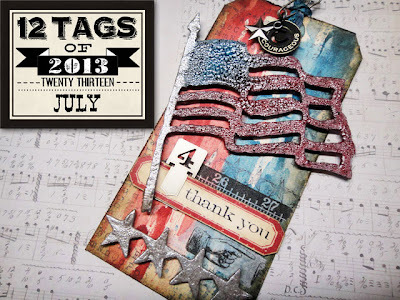 I loved her take on Tims's June tag...and what a fun use of the sizzix alterations pediments die. 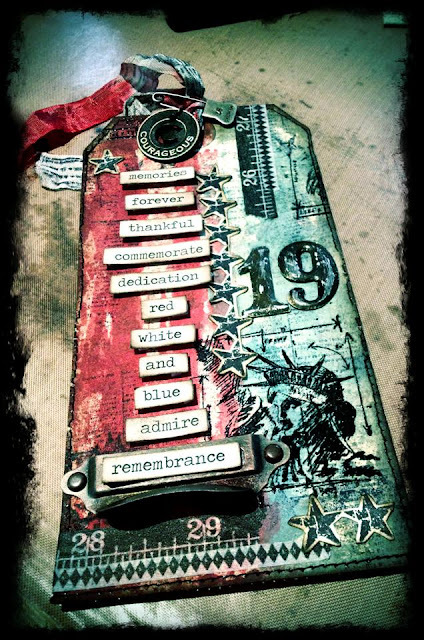 And last but not least, there is Tim's July tag, another touching remembrance to the fallen Arizona fire fighters. Love the brayer technique he used this month. I have the stain and a brayer so you know I'm going to try that when I get home! well, that's it for today. I hope those of you in the US have a great 4th of July holiday. We will be working our way back down the coast at a very slow speed (stopping to shop along the way.) I know my husband is looking forward to that, lol. Thanks for pulling these wonderful ideas all together for us. Each is just fabulous. Karen Knight's commemorative tag brought tears to my eyes. Off to visit her blog and tell her so. Happy Independence day, Paula. Hope to see you in South Africa again soon...? Have just returned from Glenda's second Kichaka scrap event: it was spectacular. Off to check out these projects from your talented colleagues. Happy 4th of July ! Great share, all of this are awesome! great stuff!! 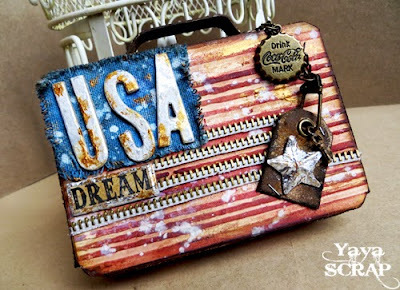 LOVE the fabric on the suitcase...cute idea.